Big things, like baby blankets, seem to go on and on. It’s still knice knitting, though. It’s Fiber Trends’ Streaming Leaves Scarf in Sundara Yarn Sport Merino. Anyway, July will be here in a minute and I’m crazy-tired-busy. What else is new? I’ll be back soon with something real to write about. Next Where did the day go? I’m always so glad when you post – dear heart. And the rss feed is working now, thanks to Mary. 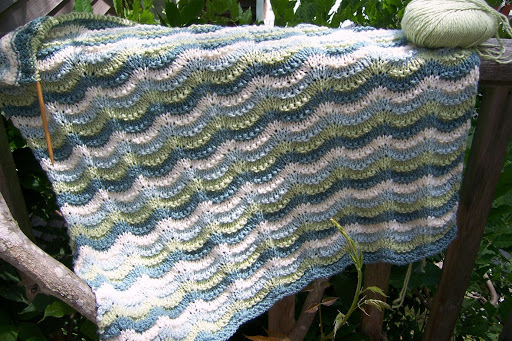 It may go on and on, but the baby blanket is lovely. 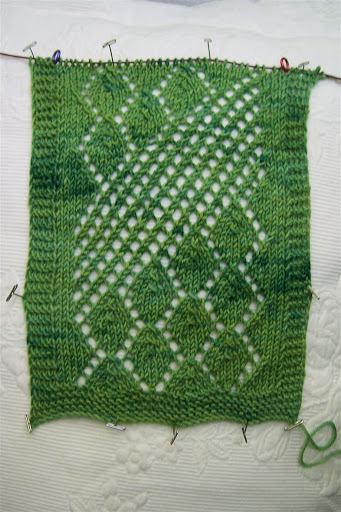 And the new scarf pattern is wonderful — great color for it, too! Beautiful baby blanket! The color choices are just perfect. The blanket is so cool!! Oh Jane, the Baby Blanket is worth every minute you spend with it. It’s so lovely. The new scarf looks great too. I like the pattern a lot. summer – ugh – I thought 35 min. would be enough time to get to chiropractor in EH — guess what – was 10 min. late -last time I left 45 min early and was 20 min. early – I am loving that blanket – I didn’t pick up my needles since last week – better get cracking on my socks or the 4th will be gone . . . The blanket is beautiful, and I’m looking forward to seeing the finished scarf. The baby blanket is so elegant, Jane (the beige is reading pink on my monitor, oddly enough). Your photographs are sometimes my “artistic” pause of the day–would you ever consider publishing them as notecards? What a great color combo in your blanket! oohh – I could just dive my fingers into all that luscious Sundara yarn. It’s so divine.You’ve been on my mind a bunch recently. Hope you’re taking time to spoil yourself a bit now and then.